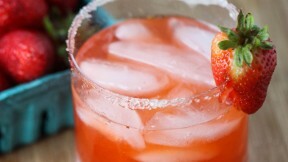 This summer cocktail recipe for a strawberry honey smash is complete with a sugared rim. Food blogger Jenna Weber shares liquor substitution options in a full post on the Fresh Tastes blog. Slice the strawberries and muddle together with the simple syrup and honey liqueur. In a cocktail shaker, combine the strawberry mixture with the lemon juice and vodka. Add ice and shake. Strain and serve in a glass with a sugared rim with a strawberry on the side.